3. Make sure you are getting a good signalYou will need an R/C radio transmitter(Tx) and receiver(Rx) pair, which is the most expensive part of the project, but can be used for every future project you might have involving R/C. I went with a 6-channel FM system, but I have tested a 27mHz AM transmitter/receiver and it works just as well. The beauty of the Arduino is that if you want to adjust the deadband or the motor-speed at turn-on, (unlike commercial ESC’s) it is all easy changed in the Arduino IDE.Once you have your radio, all you need to do is upload the code to your Arduino, plug in the 2 channels that you want to use from your radio receiver into Digital pins 2 and 3 of the Arduino (these are the 2 external interrupt pins on the Arduino) and you are ready to control whatever you want. If you don’t have a batter pack for the receiver, you can run jumper wires from the Arduino +5v and GND to the R/C receiever for power, you only need to supply a single channel with GND and +5v (it is not necessary to power every channel). If you care to know, the code uses the Arduino’s 2 external interrupts to capture when the Rx signal pin changes states (goes from HIGH to LOW or vice versa), when it does at the beginning of each signal, it calls the interrupt function which reads the digital state of the pin and if HIGH, it records the microseconds value on the Arduino system timer0. It then returns to the loop until the pin goes LOW, at which point it subtracts the previously recorded microsecond value from the new current microsecond value to determine how long the pulse stayed HIGH (which tells us the position of the Transmitter control stick). It then does that over and over really fast. I have the values constrained from 600-2400 in the Arduino code to keep things simple. Once it receives the signal and constrains it, it maps that value to be proportionally between 0 and 511, where 255 will be Neutral. The code then determines when the value changes and uses a function to determine the appropriate 0-255 PWM value in the appropriate direction and each direction has it’s own PWM output pin to control the H-bridge. I built several motor drivers before finding a design that worked for my needs. For what it’s worth, there are several nice products already out there that are fully assembled and require a lot less work if you are not interested in building your own electronics. The Open Source Motor Controller is an open source design that has been under constant community improvement for several years now and can handle up to 160amps at 36vdc! But they are over $100 and only control 1 motor. The Sabertooth 2x25amp motor controller is nice and controls 2 motors, but it is $125.So I thought I would just make an extremely simple dual h-bridge that could handle at least 25 amps at 24vdc continuous and handle surges of up to 100amps for a few seconds. 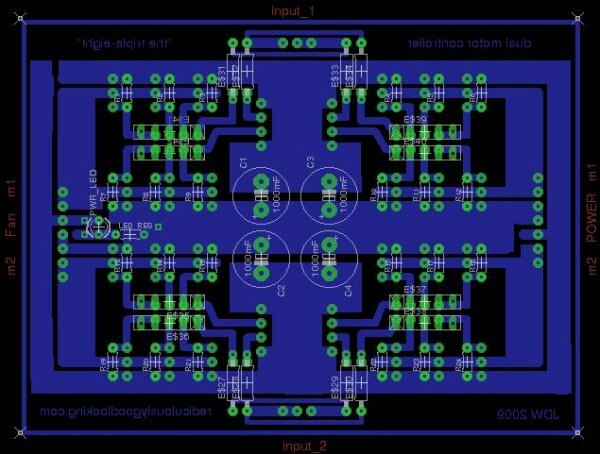 Once I found out that you can parallel Mosfets and multiply their current carrying capacity accordingly, I thought I would come up with a simple design and slightly complicate it by adding more mosfets until I had enough to handle the current that I needed. Digikey has a good selection of Mosfets to choose from and good filters to narrow it down by what you need, so I spent a lot of time looking for Mosfets that were rated for around 50amp and could handle over 30 volts. Also, they have to be cheap because my plan is to use a bunch of them. I decided on the FQP47P06 p-channel and the FQP50N06L n-channel Mosfets from Fairchild Semiconductor, which I bought from Digikey.If you are wondering what an H-bridge is, find out here: en.wikipedia.org/wiki/H-bridge and this will all make more sense to you. The wheels from Harbor Freight Tools have built in bearings for a 5/8″ shaft, hence the 5/8″ threaded-rod we are going to use as an axle. First you need to plan out the frame of your bot. Since I was attaching a lawnmower, I started by measuring the height that the lawnmower stood off the ground and took some basic measurements to see how big the frame needed to be. My frame turned out to be about 24″ wide (this distance must match the width from the center of the rear lawnmower wheels) and 48″ long (long enough for the front caster wheels to swing 360 degrees without hitting the front of the mower deck) and about 18″ tall. 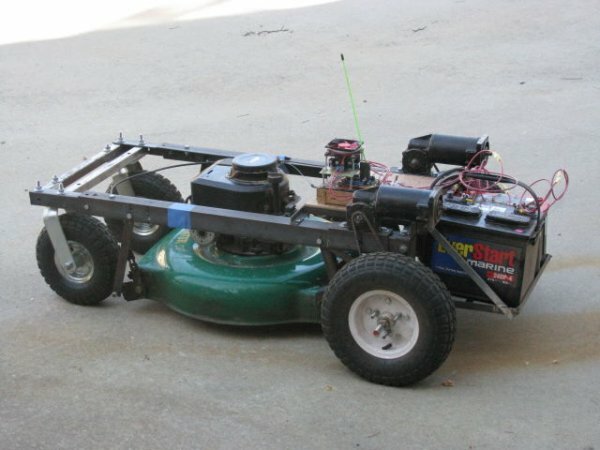 Since we want the height of the mower-deck to be adjustable, we are going to attach the mower to the frame by removing the lawnmower wheels and using angle-iron to suspend the mower-deck from the frame of the bot. 1. I started out by using 2 of the 36″ pieces of angle-iron (2″ wide) for the main part of the frame running long-ways. 4. Cut two front-pieces using 1″ square steel tubing, the same length as the rear. We need 2 in the front to bolt the caster wheels to. 5. Drill holes and bolt these 2 pieces to the front of the angle-iron from step 1. You have to measure the holes from the 2 front caster wheel’s mounting plates and drill the pattern into the front square tubing bars. Then bolt the wheels through those holes onto the front of the frame. We now need to see how far down to mount the drive axle to make the frame level. So raise the rear of the frame up until the top of the frame is level with the ground (use your level). Now measure the distance from the top-rear of the frame to the ground, this is the frame height.Now we need to take into account the height that the wheels will raise the axle off the ground. So measure the distance from the center of the rear drive wheel to the ground (the wheel’s radius). Subtract the wheel radius from the frame height and we will have the correct distance from the top of the frame to the drive axle, which we will call the frame-riser height (we need to cut these pieces next). They are going to connect the rear of the frame down to the axle which the wheels will be mounted on.6. We are going to add 2″ to the frame-riser measurement (so we have a little to work with) and cut the 2 frame risers (mine were about 10-12″ long). 7. Now drill (2) 5/8″ holes, 1 at the bottom of each frame riser (about 1″ from the bottom), this is where the drive axle will go through. Now we should have a frame that stands on it’s own with 4 wheels. However, the rear axle is not completely secure yet. We will need to add 2 braces from the bottom of the frame risers (near the axle) to the main part of the frame in order to keep the frame risers positioned properly. These braces can be flat steel and do not need to be very thick, they are just keeping the frame risers from moving. Measure about 2″ above each axle and drill a hole, then measure how far down that hole is from the top-rear of the frame and measure the same distance from the rear of the frame toward the front. Drill another hole on each side at this measurement. The support braces will need to be measured to be bolted in through these holes on each side (see pictures). The placement of the support braces is less important, meaning you can bolt them in wherever is convenient, as long as they are present. Cut an 8-10″ section of 2″ angle-iron, depending on how much room your motors need to mount. Mine only needed about 4″, so I made it 8″ to have plenty of room for the mounting bolts. Drill a hole about 1.5″ from each end of the top of this bar, this is where the mounting bolts will go through the frame. Now you have to find the center of your motor mount plate (the 8″ long piece of 2″ angle iron) and measure the mounting holes on your DC motors. Use a sharpie marker to plot the hole pattern from the motor, centered onto the motor mount plate. My motors have (4) 1/4″ diameter tapped holes in a rectangular pattern on the bottom of the gear box. Next you need to drill and cut the holes in the frame to let the motor mounting plate become adjustable. I cut these holes using a dremel tool and a cutoff wheel. You have to line up the motor mounting plate (with motor mounted preferrably) onto the frame rail and use a sharpie marker to mark where the holes will need to be on the frame rails. Start as far back as you can (without hitting any other bolts underneath the frame), and mark the center of each hole. Then move the motors forward 2″ and mark the holes again. You want to cut the holes out of the frame so that the motor mount plate (with bolts going through the frame), can move forward or backward about 2″. The holes in the frame are the width of the bolt and about 2″ long. I drilled 1 hole at each end and used the dremel to cut out the rest.The holes drilled in the motor mount plate are just single holes for the bolt to fit through, the holes through the frame were cut with a Dremel tool with a cutoff wheel to make channels for the motor mount bolts to travel forward/backward through. You want the 2″ angle-iron motor mount bracket to set as much on top of the main frame rails as possible, the bolts (which you can’t see with the motors mounted) that hold the motors to the motor mount plates will keep the motor mount plate from laying flat against the frame bars. Go ahead and mount the motors loosely to the frame using 2 bolts on each. Now get your 10′ of #25 chain and wrap it around the main drive sprocket on the wheel. With the motors pushed all the way toward the back of the frame (closest to the drive wheel sprockets), wrap the chain around the motor drive sprocket and mark where they overlap. You need 2 of the universal chain links from to connect the 2 loose ends. Cut the 2 pieces of chain and connect them to each side with the universal links to connect them.